What’s New? Vietnam cement and clinker sales volume reached record high in 2018 thanks to strong domestic market and robust export activities. Given the strong demand and increasing price, local cement manufacturers enjoyed healthy, improved financial performance from average 14.5 percent EBITDA margin in 2017 to average 16.9 percent EBITDA margin in 2018. 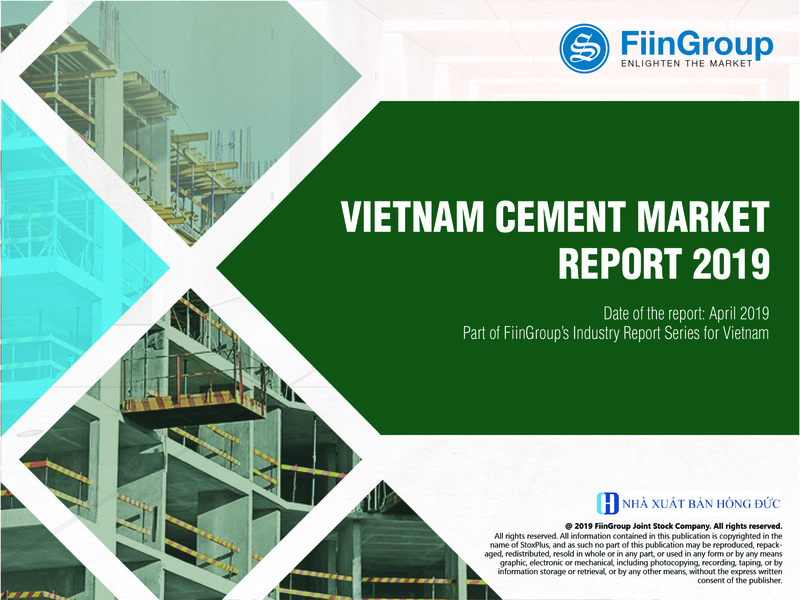 This 2019 issue provides the latest information on current supply – demand situation in Vietnam cement sector with the in-depth analysis on key growth drivers as well as additional capacity projection until 2030. Especially, for the first time, the analysis on retail bagged cement price for PCB30 and PCB40 by region and key brands is also included in this report. Domestic market consumption improved significantly in 2018. Particularly, cement domestic sales volume reached 64.8 million tons, posting a y-o-y growth rate of 7.0 percent. By region, cement sales volume in the North and South grew at 8.9 percent and 6.7 percent in 2018 while the figure was only 4.0 percent in the Central. Cement & clinker export volume was booming in 2018 with an increase of 45.5 percent, surging up to a record of 28.6 million tons in 2018. The momentum continues to remain strong in the first two months of 2019, which could be explained by higher price of clinker in China. In fact, Chinese Government has implemented an unprecedented pollution crackdown by shutting down steel and cement factories in the effort to address China's infamous pollution, affecting 10.0% cement production capacity in this country. Despite supply surplus situation on national scale, there is a certain temporary shortage in some border provinces near Vietnam. Thanks to robust clinker demand from key markets, Vietnam average clinker export price rose significantly to US$38.8 per ton while cement export price was on the downward to US$49.3 per ton in February 2019. Cement designed capacity in Vietnam is expected to surge in the next three years thanks to aggressive expansion of local private players including Thanh Thang, Vissai, ThaiGroup (previously Xuan Thanh) and Long Son. The majority of new capacity is in the Central where demand is relatively low compared to the North and the South. Despite supply surplus situation, domestic cement price has followed upward trend since November 2016. Particularly, domestic cement price increased by 6 percent during the year 2018 due to the rise in electricity tariff and coal price. In 2019, given a hike of 7.3% in retail electricity tariff in March, cement manufacturers announced to increase domestic price by US$1-2 per ton in April. Vietnam cement market is expected to follow strong momentums in 2019 thanks to strong domestic demand and solid growth in key export markets. Particularly, Vietnam residential property market expects strong launches and positive sale volume in the next three years, especially for affordable segment. Several large infrastructure projects are underway such as the North-South Expressway, Long Thanh International Airport and high-speed North-South railway. In addition, key export markets of Vietnam including China, Philippines and Bangladesh continues to record increasing demand thanks to infrastructure development. Local cement manufacturers recorded an improvement in profitability thanks to increasing price and strong domestic demand. Particularly, average net profit margin and EBITDA margin increased to 3.4 percent and 16.9 percent, respectively in 2018.